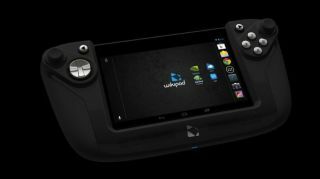 Can the Wikipad rival Vita? The wayward Wikipad finally has a launch date, at least in the U.S.
Gamers there can look for the Android 4.1 tablet starting June 11, when it will retail for $249 (about UK£162, AU$257). A global launch - including in the U.K. - is expected sometime this summer. The gaming tablet has been through a number of difficulties, experiencing changes in design and a pushed-back release date. Technical difficulties aside, it looks like those issues have finally been resolved. Appropriately, the slate will launch in the midst of E3 2013. The Wikipad comes stacked with a 7-inch touch screen, 16GB memory (with option to bump by 32GB thanks to microSD) and microUSB. It's powered by a Tegra 3 quad-core mobile processor, which has been optimised for cloud gaming with a 12-core Nvidia GPU. There's even a 2MP front facing camera for snap-happy gamers. Looks good, where are the games? Though the Wikipad comes with a dual-analog controller aimed to game, it's not clear just what titles will make it onto the tablet. It originally had a deal with game streaming service OnLive, but the currently obscure company wasn't mentioned in the press release. That's not to say the Wikipad will be without games and services. PlayStation Mobile is offering its support, while users can access Google Play and Nvidia TegraZone titles. Big Fish Instant Games, a cloud-based gaming service, has more than 250 casual games up for Wikipad use. Will the Wikipad catch on? We have our reservations, though with a price that rivals the PlayStation Vita, we'll keep an eye on this one. Want to know what to expect out of E3 2013?